This entry was posted in community news and tagged events MOTM on August 4, 2015 by James Day. Woodcliff Lake, NJ – August 3, 2015… Another MINI ON THE MACK is in the history books! Although the world record attempt at the largest parade of MINIs fell short, the biennial MINI owners rally organized by MINI of Grand Rapids and MINI USA did manage to set the new record for the largest gathering of MINIs in the U.S. 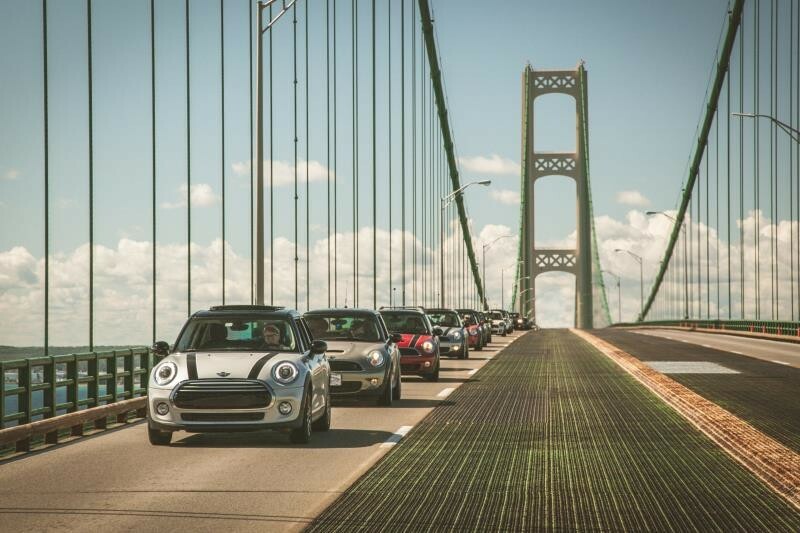 The event attracted 1,319 MINIs of all shapes, colors and sizes for the rally across the 26,372 feet long, 500 feet high span of Michigan’s Mackinac Bridge – missing the world record by only 132 MINIs. This was the second attempt at the world record for the largest parade of MINIs. In 2013, the brand had 848.5 vehicles attend the event. The current Guinness Record was set in 2009 in the UK by the London & Surrey Mini Owners Club, which brought together 1,450 MINI cars to fill the historic 2-mile auto racing circuit around the famous Crystal Palace Park in London. Now that MINI on the Mack is complete, MINI owners from across the country (and the world!) can start preparing for next summer’s MINI TAKES THE STATES (MTTS) rally. MINI USA recently announced that the biennial cross-country owners rally will kick off on Saturday, July 9, 2016, and finish on Saturday, July 23, 2016. The route will be announced at a later date.